At work, I was tasked with creating a class to strip RTF tags from RTF formatted text, leaving only the plain text. Microsoft’s RichTextBox can do this with its Text property, but it was unavailable in the context in which I’m working. RTF formatting uses control characters escaped with backslashes along with nested curly braces. Unfortunately, the nesting means I can’t kill the control characters using a single regex, since I’d have to process the stack, and in addition, some control characters should be translated, such as newline and tab characters. Thankfully, Markus Jarderot provided a great answer over at StackOverflow, but unfortunately for me, it’s written in Python. I don’t know Python, but I translated it to the best of my abilities to C# since it was very readable. If this is useful to you, you can download the C# version, or view the original/new code below. # control words which specify a "destionation". # Translation of some special characters. ignorable = False       # Whether this group (and all inside it) are "ignorable". ucskip = 1              # Number of ASCII characters to skip after a unicode character. out =                 # Output buffer. This article assumes you already know how to set up a SOCKS proxy, likely via SSH using PuTTY. Lots of people use FoxyProxy in Firefox to selectively proxy based on rules. FoxyProxy for Chrome exists now, which uses the Chrome Proxy API. However, this still leaks DNS via pre-fetch queries in other places in the Chrome browser (and possibly via other extensions). Assume you save this file as C:\mypac.pac and you’ve set up a SOCKS5 proxy at localhost:8000. //   top level and sub-domains. Chrome has a command line parameter called --host-resolver-rules. This parameter allows you stop DNS leaks as mentioned above. You use the MAP command to map all addresses to ~NOTFOUND except for addresses you EXCLUDE. You must keep this in lockstep with the FindProxyForURL function from your PAC. The reason for this is that you are telling Chrome to use your proxy for name resolution, for all but the regex matched domains. If a regex matches, then it will attempt to use DIRECT, meaning regular machine name resolution. If the regex matches, and you haven’t added an EXCLUDE entry, you will get a “domain not found” or similar name resolution error in Chrome when you try to reach the site. It’s worth mentioning that the EXCLUDE entries in the resolver rules do not use regex and instead just use a wild card syntax, so you will need to duplicate each domain (once with wild card and once without) to match the top level and sub-domains. Now that you understand both options and you have created your PAC file, you can now close Chrome and re-run it with new options! "C:\Program Files (x86)\Google\Chrome\Application\chrome.exe" --proxy-pac-url="file:///c:/mypac.pac" --host-resolver-rules="MAP * ~NOTFOUND,EXCLUDE localhost,EXCLUDE nonproxieddomain1.com,EXCLUDE *.nonproxieddomain1.com,EXCLUDE nonproxieddomain2.com,EXCLUDE *.nonproxieddomain2.com"
You can now check your IP at a site like IPChicken or by simply Googling “IP”. You can play with excluding those sites from the proxy (but be sure to add them to the EXCLUDE list) and re-checking. One thing to note: Chrome does not pick up PAC changes immediately. You need to go to chrome://net-internals/#proxy and click “Re-apply settings”. You can also clear the DNS cache at chrome://net-internals/#dns. ipconfig /displaydns | find /i "example.org"
You should not see any entries for “example.org”. If you repeat the process for a site which is EXCLUDEd and sent DIRECT instead of proxied, you should see it listed in the /displaydns output. Yesterday I noticed a strange anomaly in the logs of an application I wrote and manage at work while investigating another issue. It manifested as us sending duplicate messages from a queue to a third party over and over. I looked into the code and since threading was involved, I figured there was some thread safety/shared state issue involved. I consulted with a couple of coworkers who didn’t immediately notice any issues, but I created some simple test cases to test my assumptions about threading with lambdas. Below you will see me attempting to create 5 workers, do a small unit of work, and then write to the console. I would expect each worker to write out the Int32 it was created with. My assumption was that the C# compiler would, with the lambda expression, create a copy of i for the thread being created and use that copy. I was entirely wrong. As you can see, when the worker is created, on the initial thread, each Console.WriteLine has the right value of i, but when the thread is running, it contains the last value of i, 6 (for loop increments it after its last value value causing the loop to exit). The C# compiler did not make a copy of the state, but we can do this directly and pass it in using ParameterizedThreadStart. This makes the list a collection of Int32/Thread pairs. Obviously, in our actual app, our state object is more complex than an Int32. That works, but it doesn’t really reflect the original intent. 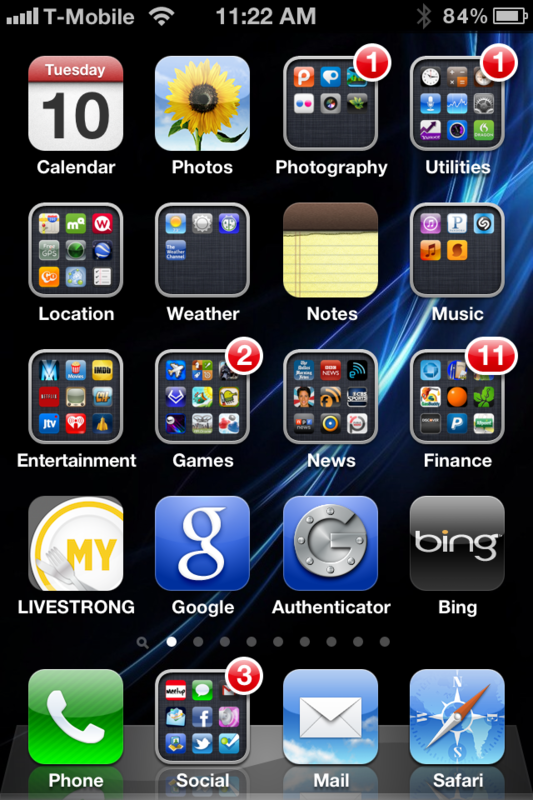 I receive X number of things to do, and in the real product, a Semaphore was used to control the maximum number of messages that were sent at a time. For instance, if I received 200 messages from the queue to send and I can send 50 messages at a time, I would spin up 200 threads which would wait on a semaphore, sending 50 maximum at a time. Obviously this is inefficient, and I don’t really have an excuse for why I did it this way when I converted it from a single-threaded process that could not keep up with demand to a multi-threaded process which ended up with this duplication problem. In retrospect, I would never have done this. The following has a queue of 15 work items which is serviced by 5 worker threads and represents close to how the code works now. Worker 4 finished running job 4. Worker 5 finished running job 5. Worker 1 finished running job 1. Worker 2 finished running job 2. Worker 3 finished running job 3. Worker 1 finished running job 8. Worker 2 finished running job 9. Worker 4 finished running job 6. Worker 5 finished running job 7. Worker 3 finished running job 10. Worker 1 finished running job 11. Worker 1 has no more work. Exiting. Worker 2 finished running job 12. Worker 2 has no more work. Exiting. Worker 4 finished running job 13. Worker 4 has no more work. Exiting. Worker 5 finished running job 14. Worker 5 has no more work. Exiting. Worker 3 finished running job 15. Unfortunately, this code is limited to .Net 3.5 right now, but this particular problem looks like a great match for the Task Parallel Library in .Net >= 4.0. It would offload all the thread handling to .Net which is particularly well-suited to this problem: running tasks in parallel. of Feb 24, 2014 until mid-day Feb 26, 2014. New uplinks were installed in Lewisville and Plano which were improperly configured and the configuration has been corrected. The information below remains for historical information on the problem and a workaround. 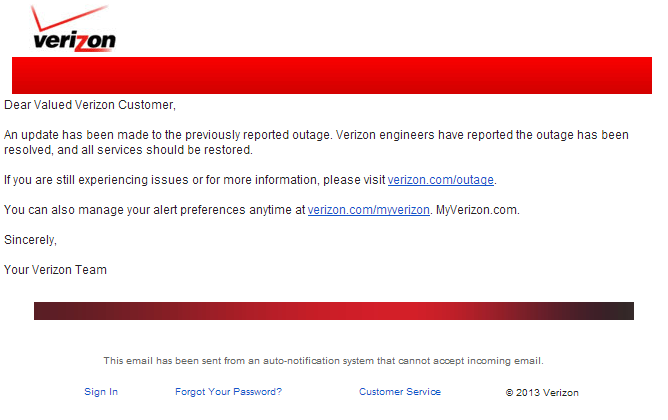 I live in the Dallas market for Verizon FiOS which is where it seems the problems are happening. but I had many other issues on other CDNs. 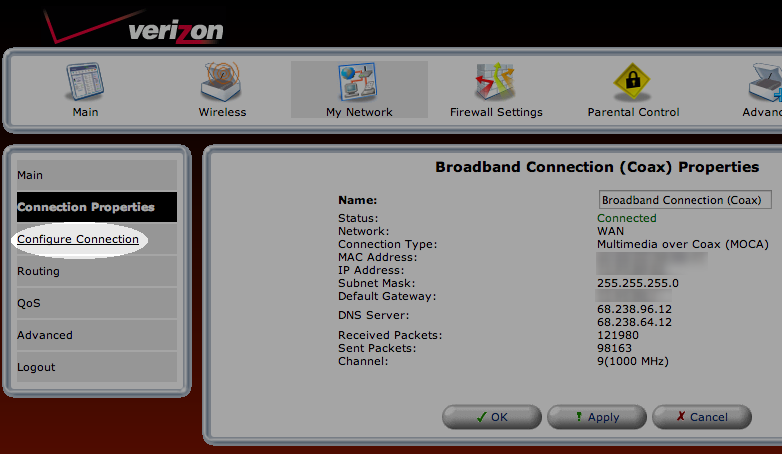 Trying to view other sites, such as MitchRibar.com, would never succeed for some other FiOS subscribers and me. The error displayed in Chrome was ERR_CONNECTION_RESET. I called Verizon multiple times and they were no help of course. Since a ping worked and since a traceroute exited their network they said that the problem was either on my side or YouTube’s side and didn’t care that it affected multiple sites. I tried to explain the difference between ICMP and a TCP session but they aren’t that smart, of course. They wouldn’t even talk to me until I plugged in their router which is a terrible piece of equipment I haven’t used for years. I obliged and that’s when I got the above from them. They would not let me talk to a higher tier of support. However, after finding out some friends had the same issue, I was tipped off to this forum post by started by another Verizon customer. You’ll see most if not all in the thread are from the Dallas market. I did some ping tests to validate that the problem is the MTU setting. Somewhere in Verizon’s network, close to the DFW side of the route, someone has messed up the MTU and reduced it from the default of 1500 to 1496. Keep in mind that there is a 28 byte header so the successful (non-fragmented) ping size + 28 = MTU. In the below paste, -f prevents fragmentation of the packet and -l 1472/1468 sets the ping packet length. Keep in mind that the IP header adds 28 bytes and also ping parameters are different on different platforms. This example is from Windows, but check the parameters for your platform to set these options. As you can see, 1472 (which equates to a 1500 MTU [1472+28=1500]) did not work. Lowering it until I got to 1468 worked, which equates to an MTU of 1496, so you can see, because of Verizon’s now-broken network, we must lower the MTU from the default of 1500 to 1496 to ensure the packets traverse the network correctly. 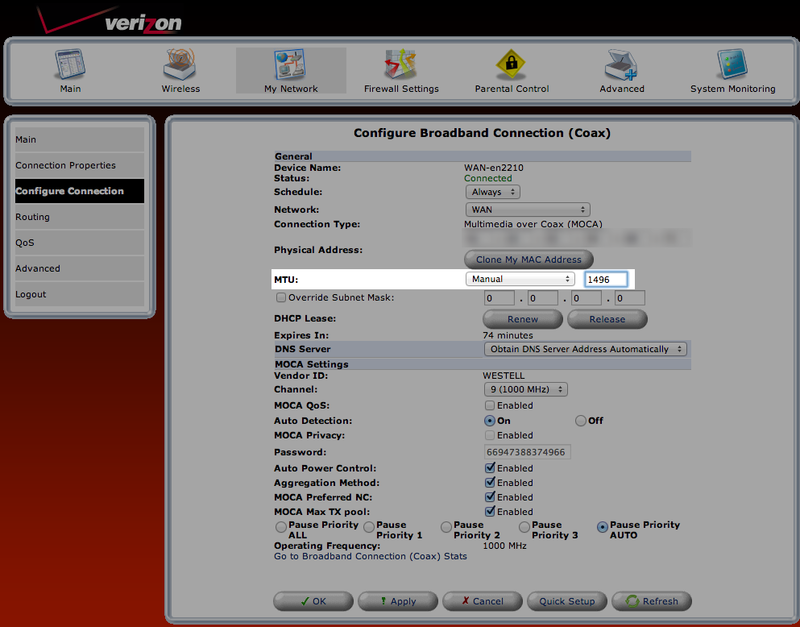 I don’t use Verizon’s router (I use DD-WRT and changing the MTU is easy: Setup -> MTU) but Jake Smith provided these screenshots to me that I edited to show the steps. 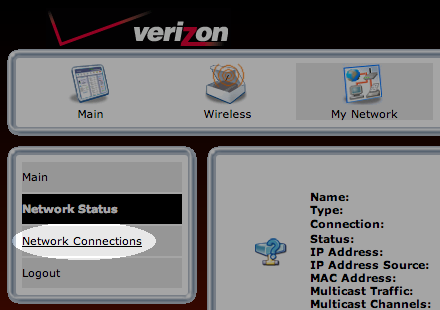 They come from a regular Verizon FiOS router. 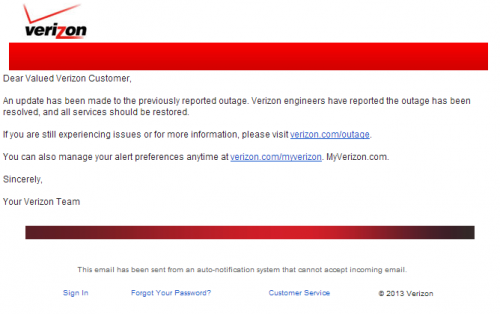 You should not need to change router settings unless this problem has happened again after Feb 26, 2014. Please see the note at the top of the page. There are many resources available to find out what your router’s LAN IP address is. Connect to this address in your router. 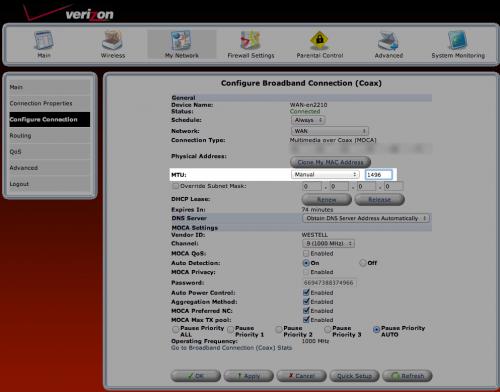 Your FiOS router has the default password printed on it if you have not changed it. My router’s IP is 192.168.0.1, but yours may (and probably will) be different. With my example, I would navigate to http://192.168.0.1 in my web browser. TLDR: The title is pretty much the entire post. to walk the zip file looking for a certain file. Two versions of our downloading program exist: one for the old version and one for the new version. broke our import process. The files are fixed width text formats. the zip file myself and extracted it and the resulting file looked fine, so I dug deeper. This is the code as I had it. with more options to be explicit about how I want the file to be opened and shared. Update: Yahoo Pipes is shutting down. As a result, I started a new software project to replace it. The feeds are updated below. to read each and every comic. All you can see is what’s to the right here. Penny-Arcade did this quite a while back too, and I’ve been using someone’s Yahoo Pipe that fixes this same problem unfortunately this pipe no longer worked anyway and is replaced below. It just pulls the comic strip images from the page and displays it instead. I never dug into how it worked or Yahoo Pipes at all. Yahoo Pipes is pretty awesome. It lets you just drag and drop things and connect them to arrange a workflow. I’m a developer, but I don’t think you have to be to use Pipes. 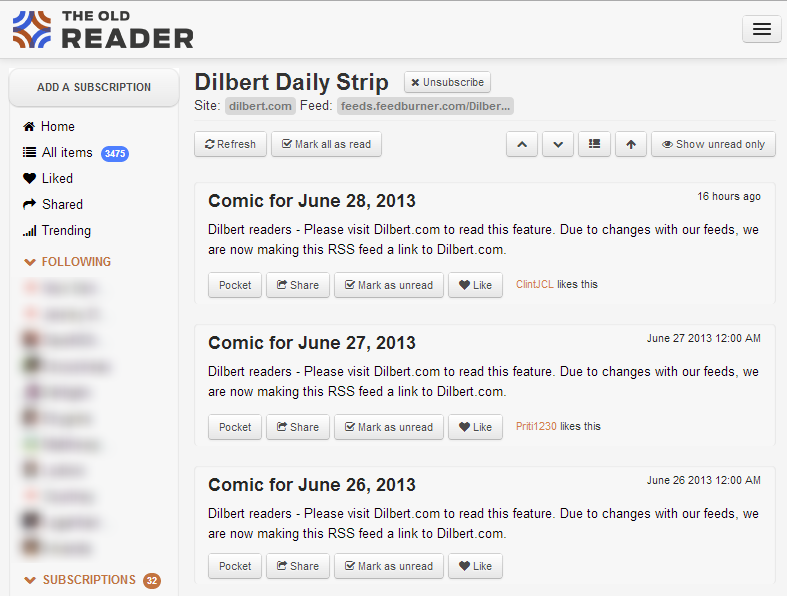 Using the Penny-Arcade one as an example, I rigged up two versions of the Dilbert.com feed. Using my Google App Engine hosted new software project, I’ve replaced and added new feeds below. The feeds auto-update every 2 hours and the service serves cached copies, so it should be extremely fast compared to the old pipes feeds. 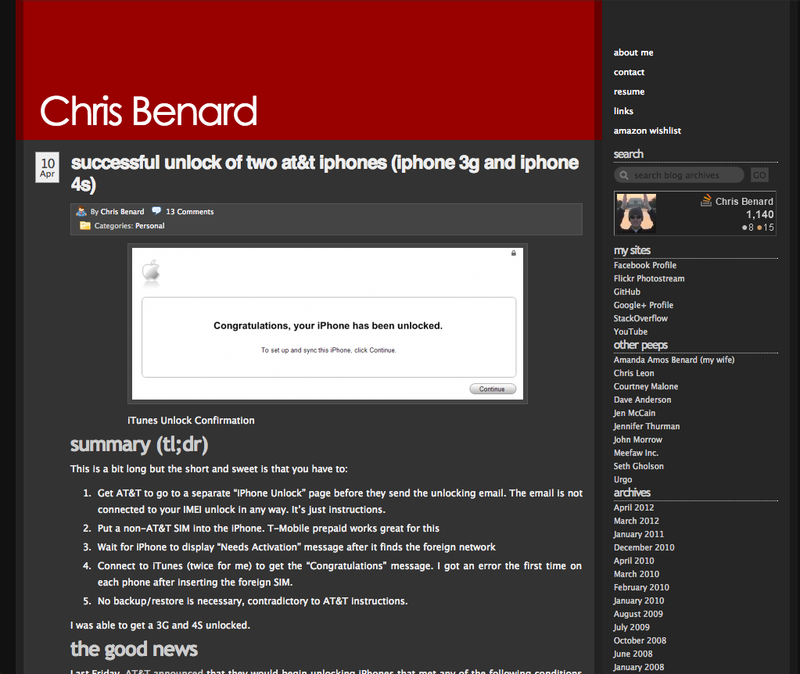 Transformed (from Atom) Modified RSS Feed. This is a hack. Only use this if you have programmatic requirements requiring RSS over Atom. Modified RSS Feed. This was requested by a reader previously. I no longer use The Old Reader. I now use NewsBlur and I pay for a premium subscription. 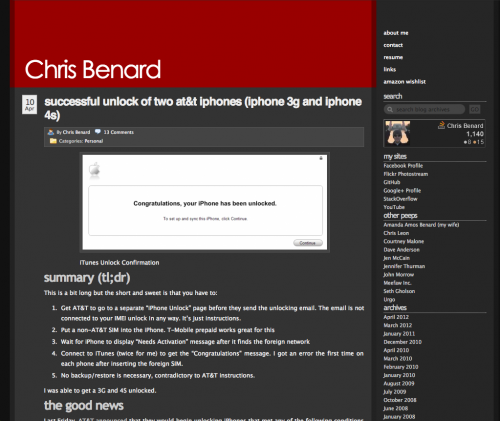 I find it to be the best news reader for serious RSS users now. You can follow me there. Now you get comics back the way they used to be (including images) and don’t have to link out to the site to read it. 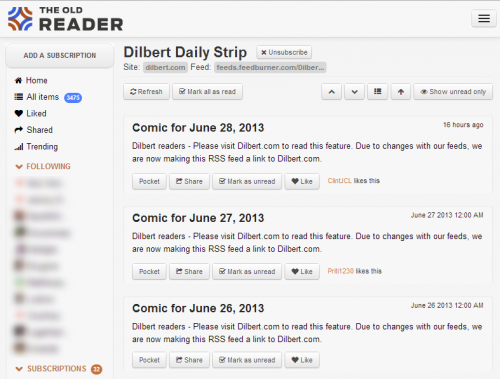 You can click the title in your feed reader to open the comic’s page (for discussion or other purposes). 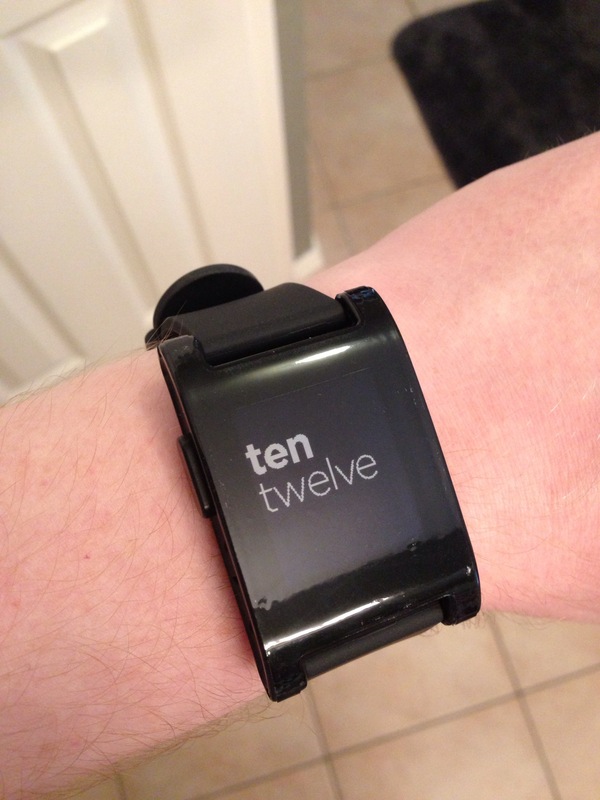 I got the Pebble Smart Watch a couple of weeks ago, and I’m really enjoying it. 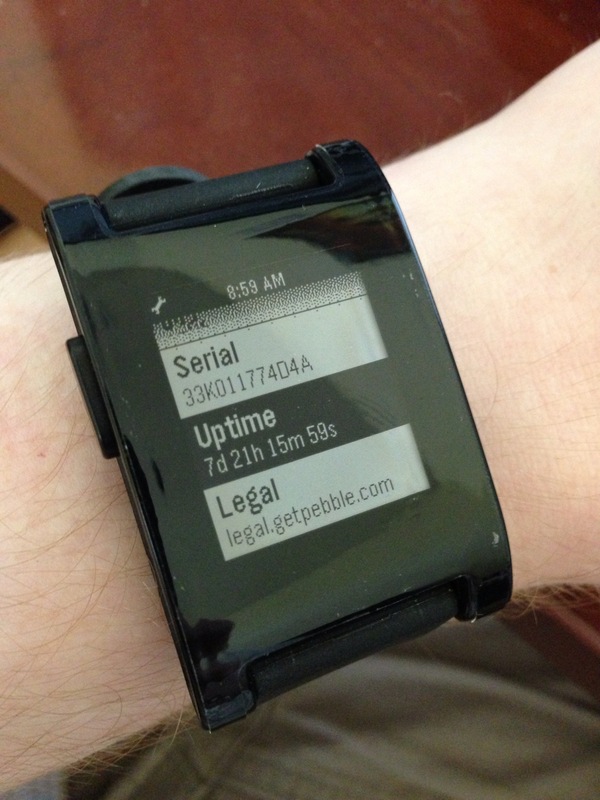 It’s a watch that connects to your smart phone and lets you get your notifications like text, emails, and phone calls on your wrist without digging out your phone. It lasts a really long time, about 9 days before I had to recharge it, and it charges with a little magnetic connector. 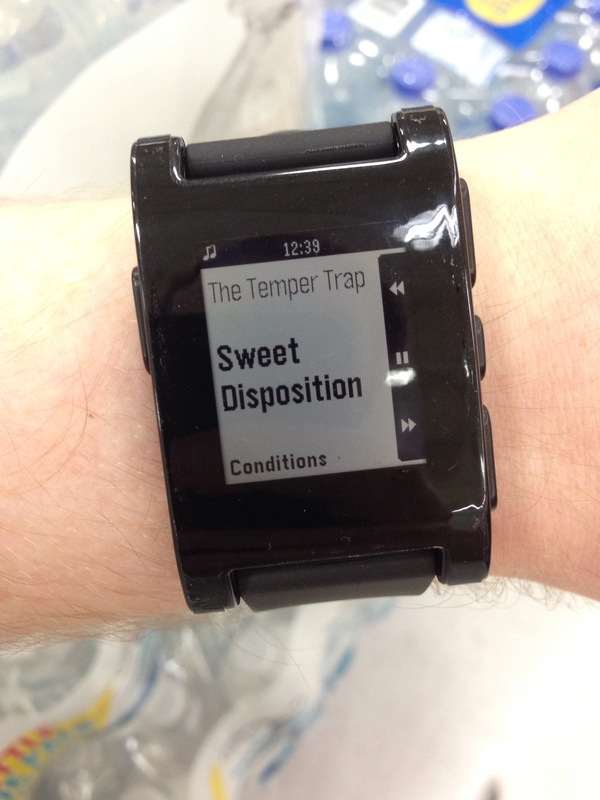 It has lots of watch faces and apps already, thanks to its SDK and developer community. 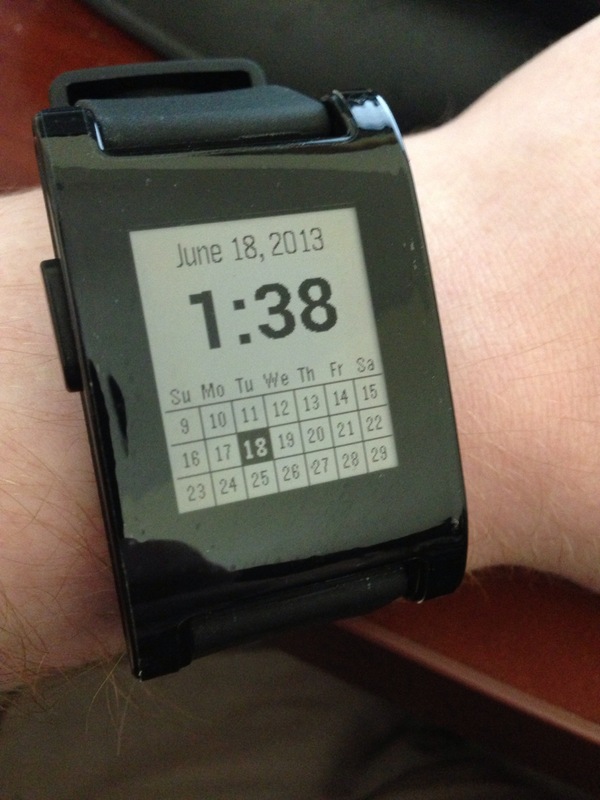 I’m really partial to the calendar face pictured below. 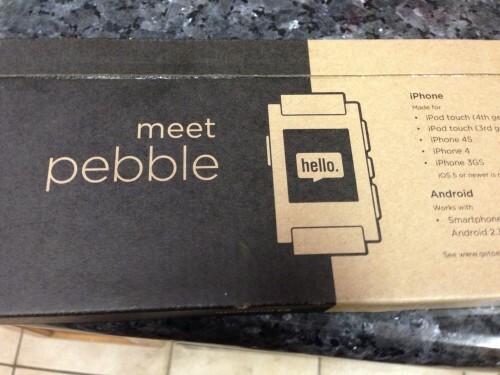 I haven’t worn a watch since 2006, but I’m already used to it again, for what it provides me. Check out the additional pictures below. 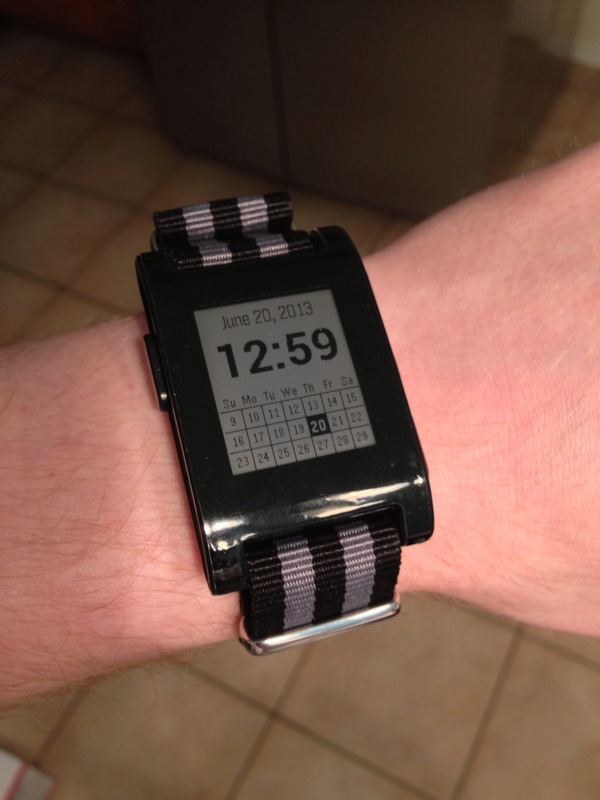 I changed out the default rubber strap for a NATO strap. My last post was in April 2012, so it’s probably time for an update. I successfully imported my blog into a static HTML generating tool called PieCrust. It creates the files serving this site now. As part of the move, I totally redid the site’s design and functionality at the same time. I had a lot of help (personal and technological). You can read more about it in the about the site section, linked at the bottom of every page. I love the new host, which was recommended to me by Juan. I’m hosted at Digital Ocean now. I got a great deal by getting 2 months free by using code SSDTWEET. That code should work through June 2013, and if it’s past then when you read this, just google another coupon code. What you get with Digital Ocean is pretty amazing. You get to pick your Linux distribution, and they spin up the instance in under a minute. I was able to provide an SSH public key and they spun it up with no root password, with the key, so I was able to login securely. Setting everything else up has been a breeze, since I have full root access, and they even have console access (virtual KVM) in case I screw up the firewall rules. I locked down the firewall, set up nginx (web server) with Google’s pagespeed module and php5-fpm, which is needed for a few dynamic things like the site search. I’ll be posting more about that later. I get all that for $5/month, and I emailed their support a question about DNS and got a quick reply back. So far, I’m very happy with their lowest end instance.